Shiv Sagar from Bombay is here in Delhi and that too just a 15 minutes drive from home. When we decided to go there for a dinner early this week Arvind was not too keen saying it is a vegetarian place but I was sure that he would like the food there. Being born and brought up in Banaras he is the one who would walk an extra mile for a good kachori or golgappa I know. 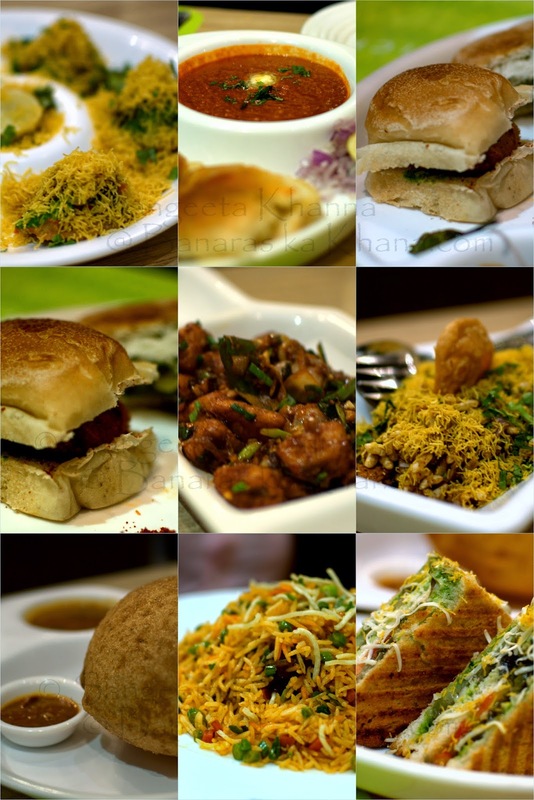 The first thing we tried at Shiv Sagar was a Sev Puri that he loved. The juice tasters that come in test tubes was a great idea, fresh juices of mosambi (Sweet Lime), Orange, Pineapple and Watermelon can be ordered from the 'live juice bar' and they also have a few juice based mocktails called Ganga Jamuna and Maramari. One can decide after tasting and according to the mood of the day. Our mood for good food was set already. 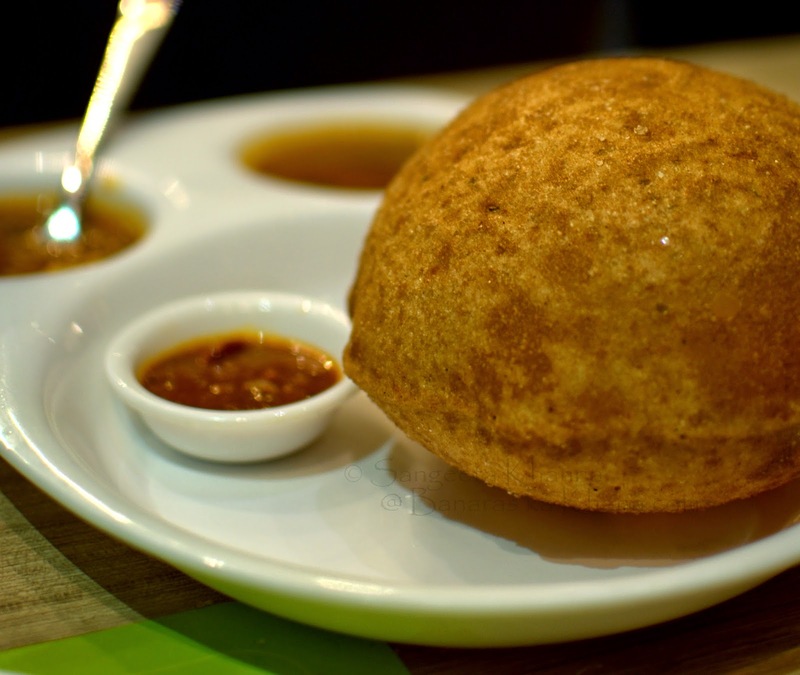 We had great expectations when the Vada Pao came to our table with all it's accompaniments of red lasun chutney and fried green chilly etc but the real test is in the pao (the bun) and the potato bonda inside. I found the Vada pao good on both counts but I have had better Vada Pao on the streets of Bombay so may be some friends from Bombay wouldn't find it good enough. I loved the Pao Bhaji a lot more, the Pao not too soaked in butter and the Bhaji buttery in texture but not floating in butter, the spicing perfect for me. I found the quality of he Bombay Pao perfect and asked Varun Puri whose team has brought Shiv Sagar to Delhi, he informed that the Pao is in fact brought in from Bombay twice a day for the sake of authenticity. I find this kind of commitment towards delivering authenticity really commendable. 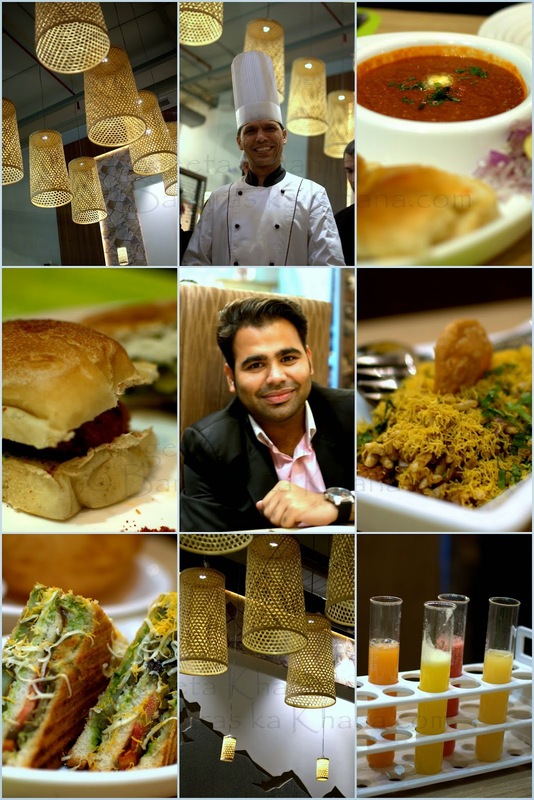 I talked to the Executive Chef Harish Joshi as well and was charmed by his smile that spreads across his face when he talks. Such a happy Chef can never go wrong in bringing great food for the guests. The Bhel mixture was also good, something that Arvind likes for his evening snack many a times but this one had a Bombay feel to it. 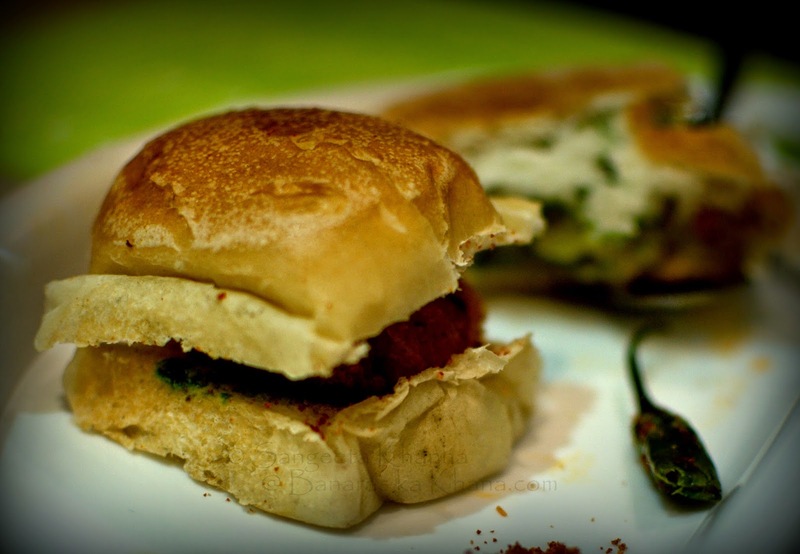 The Bombay Sandwiches were made perfectly too. 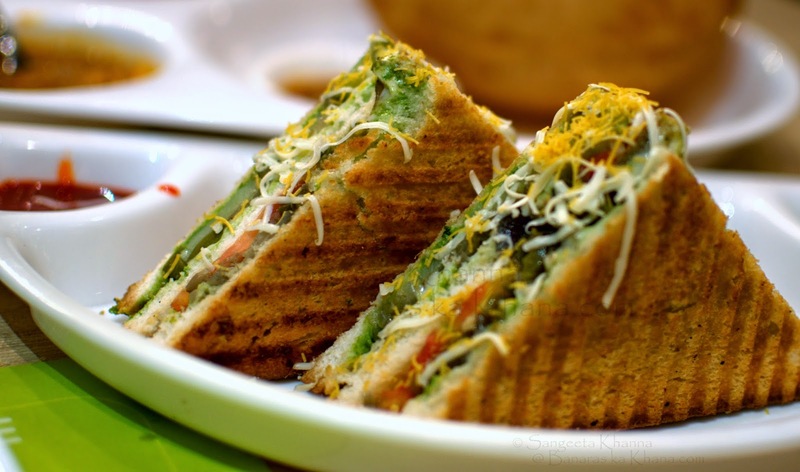 Sprinkled generously with the thin sev that stay crunchy even inside the sandwich and perfectly grilled bread. Mind that this is coming from someone who is not too find of sandwiches. I took a few bites as we wanted to taste more of the stuff on the menu, the sandwich kept calling me back that I had to ignore with all my will. Good stuff. I was surprised to see a Delhi special Bedmi Alu on the menu, it looked like a crisp ball with 3 small bowls of brown subzi but I was not prepared for the taste it brought. This is a must try at Shiv Sagar because they have created a very very good Methi ki chutney to go along with the alu subzi that transforms this Bedmi poori from an average to extraordinary. Pour some methi chutney over the alu subzi and dunk a bite of Bedmi into it, this bite would make you feel so good about methi being on your plate. Very crisp bedmi poori is a very good scooping tool for the goodness in those bowls. While the Pao Bhaji, Vada Pao and Bhel took us to the streets of Bombay, this Bedmi alu brought us back right into the streets of old Delhi. They have a spread of Indo-Chinese street food as well. The Chilly Idli and Triple Sichuan fried rice we tasted were quite addictive. I better not talk about foodie addictions, I mean this Sichuan fried rice has a base of Manchurian balls, a layer of fried crisp noodles and then fried rice over that creating a medley if taste and textures that is hard to resist. There was one more thing that felt like old Delhi and that was this Paan kulfi. With a whole paan inside, I finished this kulfi all by myself though I am known for disliking desserts. 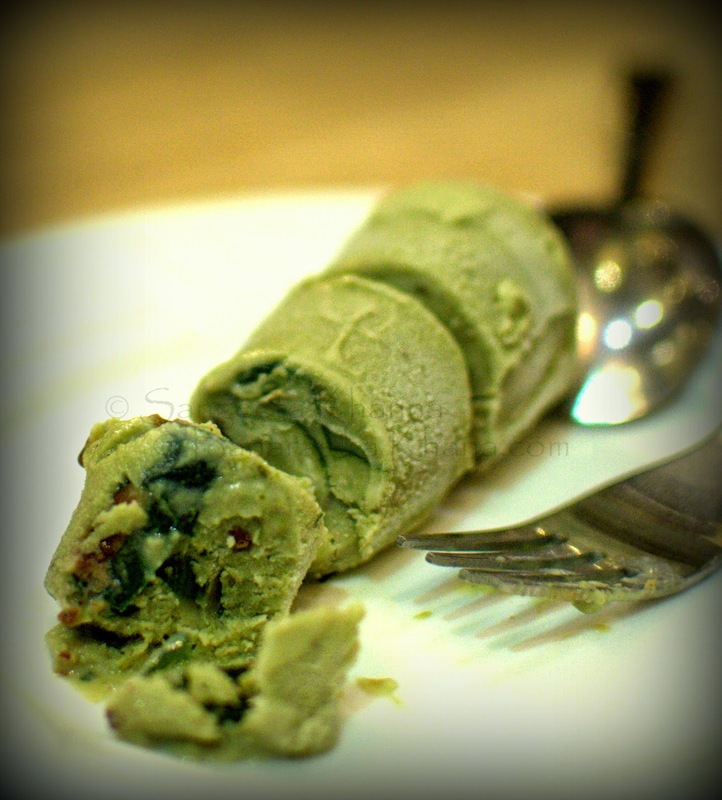 This kulfi feels like a paan and yet gives all the pleasures of a kulfi. I found it better than the famed Kuremal kulfi to be honest. 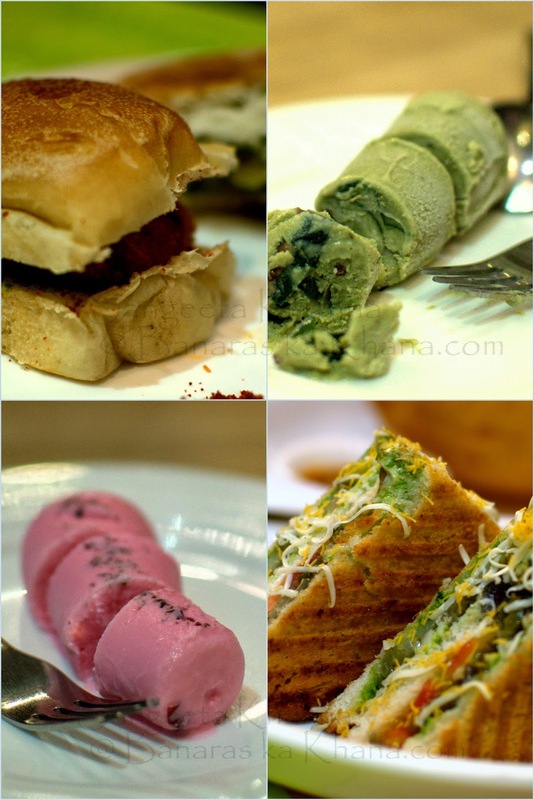 Talking about it, I am craving for this Paan Kulfi on a December midnight. Imagine. I would be going back to Shiv Sagar for the Bedmi, for the Kulfi, for the Pao Bhaji and for the Chilly idli too may be. Arvind has his choices too, he loved the Triple Sichuan fried rice, the Bhel and pretty much everything we tasted that day. I know he would be frequenting Shiv Sagar quite often now. My gut feeling was right, he wouldn't ever be disappointed with good street food and will forge his love for nonveg for a while whenever it happens.